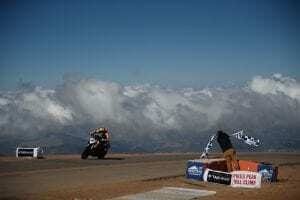 KTM Sets New Pike’s Peak Record! 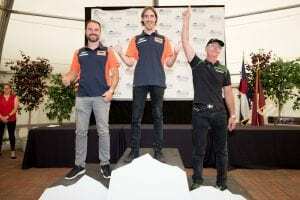 KTM, and their rider Chris Fillmore, set a new run record at the insane Pike’s Peak hillclimb event in 2017, on the Austian firm’s new 2017 1290 Super Duke R! Fillmore zapped up and around the 4,302 metre high, 199.99km long course comprising of 156 corners in a new motorcycle record time of 9m49.625s. “I set myself the goal of breaking the record as a rookie”, said Chris, “but as the practice weeks started I realized how limited time you get on each of the three sections. Then on race day, it’s the first time you actually see the whole mountain. There’s no warm-up, no sighting lap, just line up and go, and give it everything you’ve got. I wasn’t sure that it was going to be possible to break the record on this 14,000ft mountain. A lot of things were unpredictable, like the conditions and the elements. We’re the winners – yay! A huge well done to Chris and KTM – now, next time around we want to see you break that on a Super Duke GT! Previous Post:Suzuki RG(V) 500 & The ‘Two Stroke Story’ – Out Now!